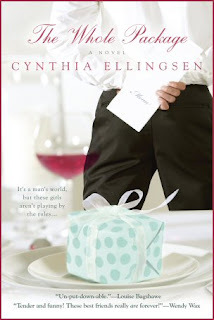 Paranormal Romance and More: Interview & Giveaway with Cynthia Ellingsen, author of The Whole Package! Interview & Giveaway with Cynthia Ellingsen, author of The Whole Package! Please help me welcome author Cynthia Ellingsen to Reading with Holly! Holly: Hi Cynthia! Would you tell us a little bit about yourself? Hi, Reading With Holly. Thank you so much for hosting me! 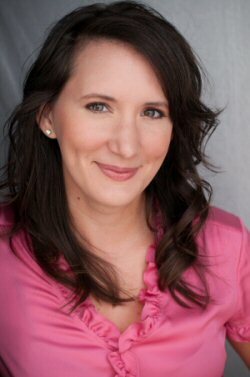 A little about myself... alright, I’m a contemporary women’s fiction author with Penguin-Berkley. My debut novel, “The Whole Package”, came out this year. My second novel, “Marriage Matters”, is slated for April, 2013. - Write! Set aside writing time every week - or heck, every day. Even if it’s just half an hour, it’s so important to get used to putting words on a page. - Set goals for yourself. If you want to write a book, commit to a time frame to complete a rough draft. Figure out how many pages you’ll have to finish per day and set a due date. Put this in writing and hang it up somewhere you can see it every day. Then, go for it! - Use caution when signing up for critique groups. I’m a huge fan of Julia Cameron’s book, The Artist’s Way. In it, she discusses the importance of protecting your work in its early stages and too often, critique groups are eager to... critique. In my opinion, you should only share your work with people who you trust and that have your best interests at heart. - Send out something before it’s ready. I know too many people who finish a book and are like, Okay! Let’s get this bad-boy published. What agent can I send it to? Typically, a book needs to be written at least three times before it’s ready to be seen. Wait until your work is ready because as always, you only get one chance to make that first impression. - Stop reading. As a writer, you must read. It’s so important. Especially in your genre, and especially the titles that are selling well. Not only will reading make you a better writer, it will help you to be in tune with what readers are buying and why. - Quit. Regardless of your goal, anything worth doing takes time and determination. Odds are good that it will take awhile to meet your goals. Hang in there and most of all, keep writing. After all, that’s what it’s all about. Holly: Can you tell us a little bit about your book [title here]? 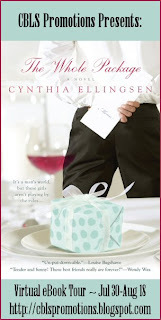 Cynthia Ellingsen: “The Whole Package” is about three women who have been best friends since they were in Junior High. They’re about to turn forty and one loses a job, one loses a fortune and one loses a husband. They decide it would be a great “revenge on the world” tactic to open The Whole Package, a restaurant staffed by scantily clad men. Cynthia Ellingsen: I thought of the What first - that three women open a restaurant staffed by scantily clad men. Then came the Who, Why, Where and How. That’s typically the format I use when creating story ideas. I was always that kid who, when playing in the playground, wouldn’t feel comfortable playing a game until I knew What we were doing. I think it’s the Aries in me. Cynthia Ellingsen: Writing contemporary women’s fiction is fun for me because it’s what I read. Typically, when I read a good contemporary women’s fiction book, I’m sad to see it end because the characters have become my “friends”. I want my readers to feel that way when reading my work. Cynthia Ellingsen: Thank you so much for the support! Come chat with me at Facebook and Twitter. I’m online at least once a day and love connecting with readers and writers. Holly: Where can we purchase The Whole Package? Cynthia Ellingsen: The Whole Package is available at Amazon, in both paperback and Kindle format. http://www.amazon.com/The-Whole-Package-ebook/dp/B004XFYRM0/ref=sr_1_2?ie=UTF8&qid=1344147857&sr=8-2&keywords=The+Whole+Package It’s also available at Barnes and Noble and bookstores across the country. Jackie - and yes, it was Jackie and not Jacqueline even though she was closing in on forty instead of the throat of the snickering girl behind her – whirled around.